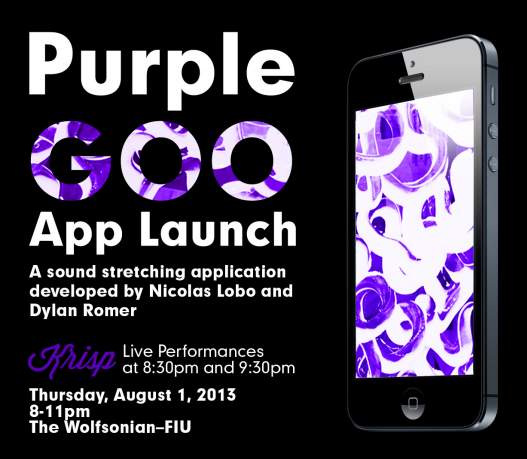 The Wolfsonian-FIU will be hosting the ingenious app launch of Purple-Goo, developed and created by artists Nicolas Lobo and Dylan Romer. To break it down, the App (only available currently on iTunes), Purple-Goo, gives listeners the tools to deconstruct pop music into its atomic structure. Using music from your iTunes library, Purple-Goo can stretch a 3 minute pop song into a score lasting hours and even days by playing each sample audibly from a sound file containing 44,100 samples a second. The party will be held on Thursday, August 1st, 2013 from 8pm - 11pm at the Wolfsonian - FIU Museum (1001 Washington Avenue, Miami Beach). Miami-based band Krisp, whom mixes indie rock, chill wave, and electro dance elements to provide their own blend of carefree groove, will be performing two live sets at 8:30pm and 9:30pm in the Wolfsonian lobby, and the live audio will then be processed using Purple-Goo to fill the “sonic time” between the live sets.